Insurance and reinsurance linked investment fund manager Twelve Capital highlights that 2017 is a very different year for aggregate catastrophe bonds, as wildfire risks which typically only contribute a small amount of any cat bonds expected loss could be the peril that tips a number of transaction into paying out. ILS manager Twelve Capital said that California wildfire damages are, in a typical year, not expected to result in cat bond losses, but 2017 has proven to be different, placing a number of bonds at particular risk. Before 2017, the largest U.S. wildfire industry loss was recorded at around $4.5 billion, a figure which is likely to be more than doubled by the October wildfires in northern California which are now set for a $10 billion or more loss to insurance and reinsurance interests. As a result, the 2017 wildfires could change the way catastrophe bonds are modelled, in terms of the contribution to expected losses that the wildfire peril contributes, especially for aggregate industry loss trigger deals. 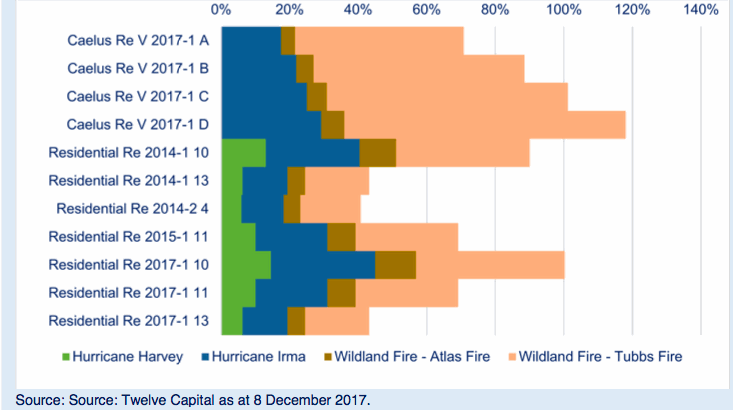 Twelve Capital says that “the situation is different this year” for aggregate catastrophe bonds, as these multi-peril transactions have already seen a substantial amount of the aggregate attachment eroded by events including hurricanes Harvey, Irma and Maria, leaving less of a buffer to protect investors in the notes. This is an increasingly widely held view, as evidence emerges in the form of loss estimates for some insurers that appear to suggest the insurance and reinsurance industry loss total could rise further into double-figures. Add in the losses that the industry will face from the December outbreaks of California wildfires and it’s possible that these aggregate deductibles will be further eroded, placing more of these multi-peril catastrophe bonds that cover wildfires at risk of loss or lowering the chances of a further event during their current risk period causing a loss to the notes. Twelve Capital has analysed some of the cat bonds it sees as exposed from sponsors USAA and Nationwide Mutual, finding that a number already face potential losses and more are approaching their aggregate attachment points. As we wrote the other week, the Caelus Re V 2017-1 Class D notes already appear to have surpassed their attachment point, while the Class C notes are clearly exposed to losses should sponsor Nationwide’s loss estimates rise. Additionally, USAA’s Residential Re 2017-1 Class 10 notes are on the verge of triggering and any creep in the insurers loss estimates will create losses to these notes, while the insurer has also extended maturity for one tranche of an older 2013-2 transaction. The ongoing wildfires in southern California have now destroyed more than 1,200 structures and the largest Thomas fire continues to burn. How much an additional insurance industry loss this will create remains to be seen, but it could be sufficient to add to some of the aggregated totals under these cat bonds, potentially putting more at risk or resulting in more payouts. Twelve Capital notes that these aggregate cat bonds that include the wildfire peril have largely been marked down in the secondary cat bond market, meaning that investors will already have factored in some mark-to-market losses in their portfolios for them, which can limit potential future losses for investors. Of course, while these aggregate multi-peril cat bonds are at risk, it is the collateralized reinsurance, private ILS and collateralized retrocession segments of the ILS market that are more likely to face exposure from the recent wildfires. A number of ILS funds suffered negative October returns due to the wildfires and it’s possible a few more could if the December outbreaks erode aggregates across private ILS and collateralized reinsurance deals.